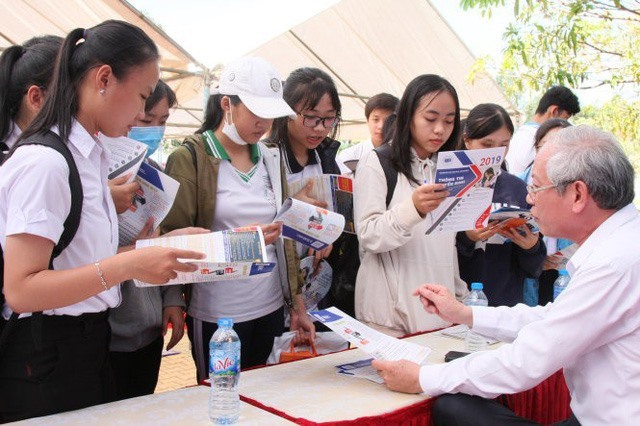 HCM CITY – Several universities have included English as one of the criteria in their enrolment plans for the 2019-2020 academic year. HCM City Medicine and Pharmacy University, for example, has three enrolment plans for new students this year. Of the three, the second requires students have a TOEFL iBT 60 or IELTS 6.0 score. The plan is being used for one-quarter of medicine and pharmacy majors. Similarly, Foreign Trade University (FTU) for the first time will admit new students based on their high school performance and English competency. Applicants eligible for FTU’s enrolment plan should be high school graduates from specialised maths, physics, chemistry, literatures and language classes from specialised schools nationwide. They must have an IELTS certificate score of 6.5, or a TOEFL PBT of 550 or TOEFL iBT of 90 points. Many opportunities are also given to students who show academic excellence. The HCM City University of Technology under Việt Nam National University- HCM City is offering 14 undergraduates programmes in English. First- and second-year students have to pass an English test based on an IELTS format and receive at least a 6.0 score. To continue their third and final year of undergraduate study, they must take the official IELTS tests and score 6.0 or score 79 on the TOFEL iBT. Dr. Trần Thế Hoàng, chairman of the University of Economics HCM City committee, was quoted by Tuổi Trẻ (Youth) newspaper as saying that many programmes and majors are now taught in English, and that his school “was paying more attention to English as one of the admission criteria”. He said the school also awards scholarships to students with high IELTS scores. For example, one year of tuition will be waived for those who score 8.0, while those who a score 7.0 will receive free tuition for one semester. In the coming enrolment season, the University of Technical Education HCM City plans to allocate 10 per cent of its enrolment quotas to students who have good high school results and either an IELTS or TOEFL certificate. Dr. Đỗ Văn Dũng, president of the university, said more schools were focusing on the importance of English because of the advantage that such skills could bring in the context of global integration. “If they have good English skills, students can enroll in free online learning courses, and after graduation can receive higher salaries and have more career opportunities abroad,” he said. Dr. Nguyễn Thị Kim Phụng, head of the higher education department at the Ministry of Education and Training (MOET), said that several universities had recently assessed applicants based on their international language certificates or national high school exam results such as the SAT exam (used in the US), in combination with their high school marks. These schools have the right to make these kinds of assessments, which are regulated under the Higher Education Law, she said, adding that the admission criteria also helps promote the study of foreign languages in high school. Dr. Hoàng Ngọc Vinh, former director of MOET’s occupational education department, said the new English criterion was a worthy one but noted that students in remote areas face more difficulty accessing English learning programmes. “Universities should also consider socio-economic aspects when prioritising English skills in the admission process, so that enrolment quotas are divided fairly,” she said. In November, Education First (EF) released its English Proficiency Index, which ranked Việt Nam 41st out of 88 countries and territories in English-language proficiency.